Musicians, makers and electronic enthusiasts looking for inspiration for a new project this weekend might be interested in this awesome automatic guitar strummer. Which has been created using a couple of chopsticks combined with a little Arduino hardware and programming. Watch the demonstration video below to learn more about the project which has been created by YouTube Make It And Fake It. The servo for the project was kindly donated to the YouTube channel by the Adafruit team, more of which are available directly from the Adafruit online store which also lists a huge wealth of other electronic components, tools and videos for reference. A servo is an automated device that provides position control and can be controlled directly from the Arduino development board using a few lines of code, jump over to the Adafruit online store for a huge range of servos for almost every need. 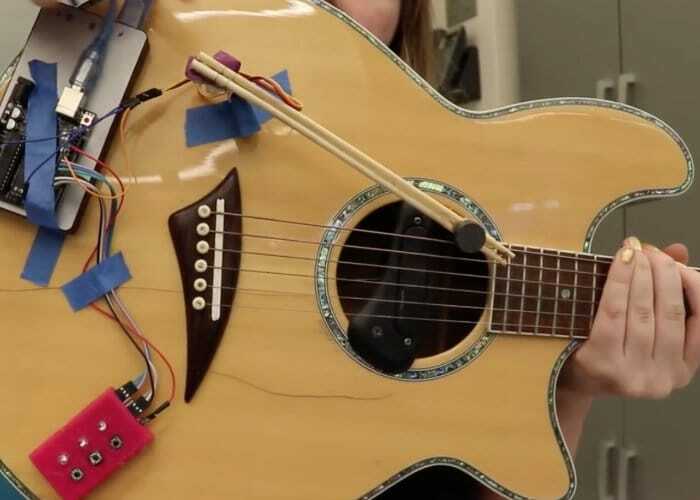 If you are interested in making your very own automatic guitar strumming system using an Arduino Uno microcontroller together with a servo motor and a pair of chopsticks, jump over to the projects official GitHub page by following the link below.